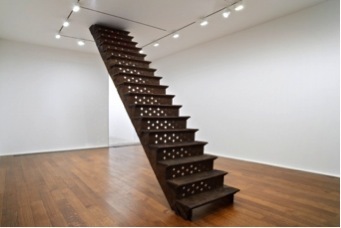 Georgia: A selection of Bharti Kher’s new works is currently on view at the Savannah College of Art and Design Museum of Art, an institution designed expressly to enrich the educational milieu of SCAD students and professors, as well as to attract visitors from around the world to Savannah. Along with a number of other interesting exhibitions featuring contemporary artists from countries such as Guatemala and Chile, the museum is showcasing Kher’s work in an incredible solo exhibition entitled ‘Reveal the secrets that you seek’. This show includes pieces from Kher’s new body of work centring on themes of male and female energies in flux, transformation, alternative realities, nature and man. 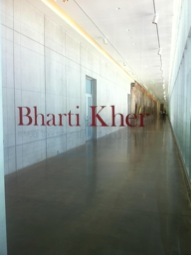 The title work, Reveal the secrets that you seek, consists of twenty-seven shattered, salvaged mirrors patterned with bindis, that envelope visitors in their own reflections which, in turn, become a part of Kher’s art. A similar idea also animated her 2010 series Indra’s net mirror, one of which was featured in our Summer Art Auction last month. However, unlike the customary dense, swirling patterns of the tiny dots, the bindis in the new works are fashioned for the first time into strict, structured grids of lines that imply codes of concealed information. 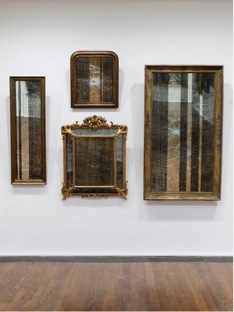 By bringing to attention everyday acts, such as looking at oneself in a mirror, and then re-assessing their self-understanding, Kher’s work repositions the viewer’s relationship with the object. Another large-scale installation, A line through space and time, consists of a 17-foot-long staircase splashed with red paint and covered with black sperm shaped bindis. Together, these works ask us to consider our relationships with life’s banal activities and objects, and to review our ideas of the self as transitory and ever-changing. Read more about this exhibition on the museum website.